HMI Services Are Free and Year-Round. Positive Youth Development (PYD), harm reduction and trauma-informed care are the theoretical frameworks in which we ground our programming. Our programs and services are all designed to help young people reach their full potential. Becoming an HMI youth member is easy, and gives you a safe place to join other LGBTQ youth in programs that will lift you up, help you learn, and let you express yourself. HMI offers new member intakes Mondays, Tuesdays, Wednesdays, Fridays, and Saturdays beginning at 3:30pm. The are done on a first come, first serve basis. 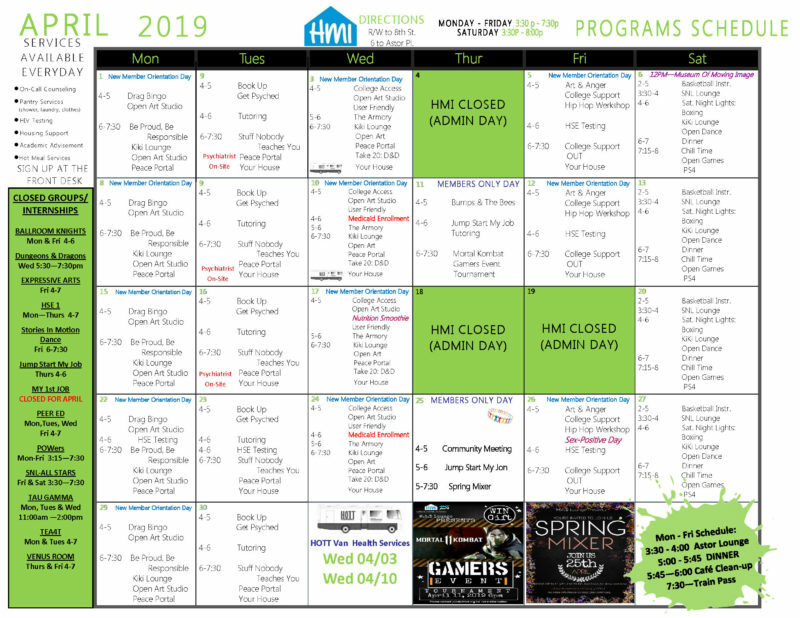 After completing their intake, new members are required to attend a New Member Orientation which happens every Monday and Wednesday at 4:00pm and Friday at 6:00pm. You can also call to schedule an appointment for other times, at 212-674-2600, extension 271. Anyone ages 13-24 can become an HMI member. You don’t have to be in school or have a permanent address. If you are in education, it doesn’t matter which school you attend. Programs and services are free and we are open 6 days a week, all year-round. Our programs and services are designed with LGBTQ youth in mind. LGBTQ stands for Lesbian, Gay, Bi-sexual, Transgender, and Questioning. HMI is a safe space for all youth ages 13-24, regardless of sexual orientation or identity. No matter how you identify, you are welcome here. Come join us! If possible, bring a form of ID with your picture and proof of age. After completing an intake, you’ll be invited to New Member Orientation which happens every Monday and Wednesday at 4:00pm and Friday at 6:00pm. 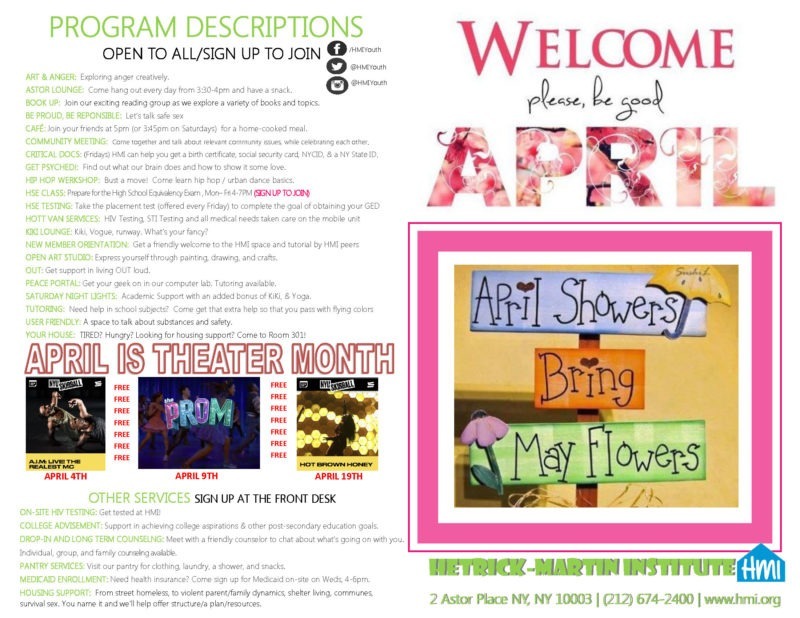 Download the guides below for services available to HMI members and for resources outside of HMI that are available to youth ages 13-24 in New York City. The Trevor Project Support Center: Articles, FAQs, and Help Guides on variety of topics including coming out, healthy relationships, gender identity, and more. Directory of Services for LGBTQ Youth by State: Find local resources in your state in this handy guide from Lambda Legal. Hetrick-Martin Institute is located in New York City. Hetrick-Martin Institute and the Harvey Milk High School are located in the same building, one block away from both the R&W (yellow) and 6 (green) subway lines — R/W to 8th Street; 6 to Astor Place. Get Directions. Hetrick-Martin Institute: NJ is located in Newark, New Jersey.